Table Talk with C and C: Reading with Fluency! During the past few weeks in guided reading I have been doing a heavy focus on reading fluency with our little 2nd graders who are struggling to read on grade level. Fluency is such a critical piece to reading and can often be dropped to the wayside with all of the other areas of reading that we tend to focus on. As a second year Reading Specialist in a K-2 building, I have realized how building the foundation of fluency skills has such a great impact on the rest of a student's future in reading. For most, the skill of reading is a natural, sequential process, but for our other learners who may have come to school with limited text experiences or who haven't picked up on how reading sounds, seem to need more guidance and direct teaching on fluency strategies. While most students can read the words in the text, often times you'll hear readers sound very flat and monotone; making it VERY difficult to listen to! It drives me crazy when I listen to some of my readers who have paid little attention to the author's clues (pictures, bold words, punctuation) to help them make their reading sound more interesting! Those "robot" readers could use the most help in fluency strategies to help them build even more meaning of a story/book while they read. Some of our most struggling readers have learned bad habits and that reading is simply just reading words. 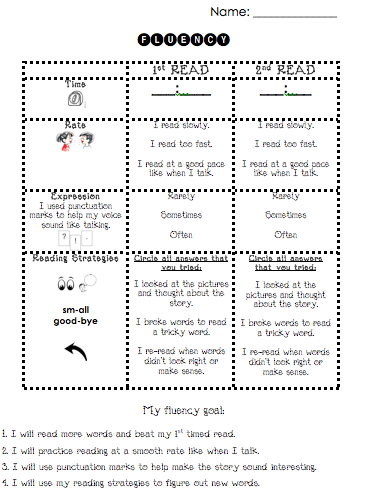 To help our most struggling readers, I have created a guided reading fluency self-assessment rubric to help students stay focused on building their fluency so that they can begin to read for meaning and make reading sound more interesting. As I introduced the fluency self-assessment rubric I first modeled for the students a good and bad example of reading fluency and self-assessed myself. This Think Aloud strategy helped my students see what kinds of things they need to pay attention to while they read. I really like using the rubric because it gives students a visual and reminder of what we do as we read to sound phrased and fluent! Students got excited when they beat their 1st read time and were putting words together to make their reading sound nice and smooth!! Students were able to use their 1st read self-assessment answers to help them improve on their 2nd read. My students really seemed motivated and excited about their self-assessment because it helped them improve their fluency! It was so great to see their faces light up as they worked hard and applied more effort on their fluency! This rubric is meant to be used with your student's guided reading books (instructional/independent books) but with your supervision and guidance. Students will read the same book twice and assess themselves on the above categories. Teacher support is recommended to help students build an understanding of what fluency sounds like. Once the student has completed both reads of the book, help the student choose a fluency goal that they think they need to work on to become a more fluent reader! Click on the image below to get your own copy from my TpT store! Carrie - Love the idea of having students self-assess. I have some robot readers, so this will come in handy. 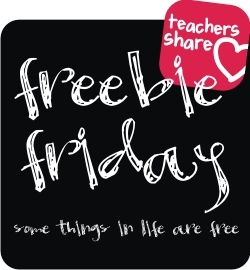 Found you through TBA's Friday Freebies.